Introduced and invasive species can present big problems, particularly when those species are charismatic, finds a recently published paper in the Ecological Society of America's journal Frontiers in Ecology and the Environment. However, if an animal has that elusive quality of charisma, people often don't want it to be controlled, even if it's harming the environment. Inevitably, these imbalances in public perception of introduced species influence the way those organisms are managed. Take the ring-necked parakeet (Psittacula krameri) for example. The pet trade has led to an established population of parakeets in Europe, far outside the species' native range. Even though parakeets can transmit diseases to native birds, compete with them for nesting cavities, and are recognized as a crop pest, the public enjoys seeing them in parks, gardens, and homes. Introduced parakeets tend to be released in cities, but the parakeets actually exact the most damage in rural areas. But because people have grown used to them, they are likely to oppose eradication efforts that take place before the birds become an established nuisance. Opposition to the management of charismatic species can be exacerbated by these "social-ecological mismatches—differences between the scales of interacting social and ecological systems. In the parakeets' case, the introduced birds have not been around for more than a few decades, which is not a long time on an ecological scale. But it is long for humans—many have grown up knowing the parakeets are part of their neighborhood, and so oppose efforts to manage them. 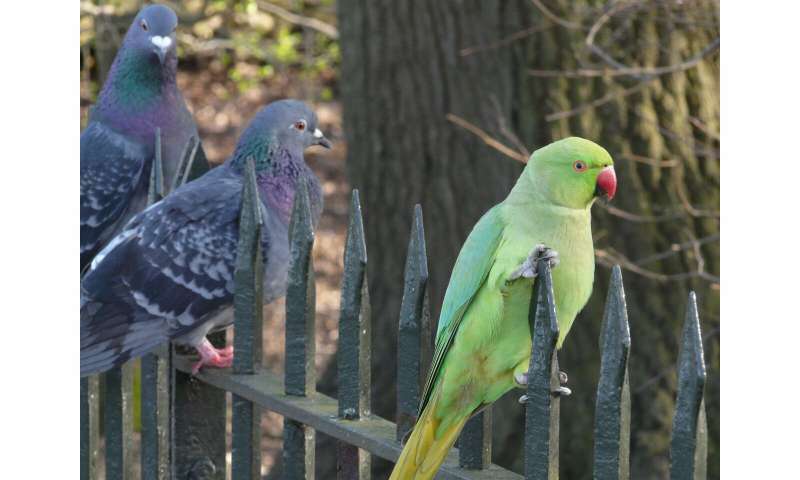 Ring-necked parakeets and feral domestic pigeons both frequent some urban areas in the UK, and people have grown used to seeing them in their local parks. Credit: L. Pycock. The paper argues that scale—and specifically for mismatches of scale between social and ecological systems—is a key influence on many conflicts involving introduced-species management. In a nutshell, the average citizen or policymaker experiences things in "human time" while ecosystems and introduced species experience things in "ecosystem time." The same goes for differences in spatial scale; humans experience things on a human scale—their neighborhood, their city, things at the level of their own experience—while ecosystems and invasive species have more far-reaching consequences that are tough for people to comprehend. This makes it difficult to enact policies that are in line with the way ecosystems behave and species invasions occur. Free-roaming horses (Equus caballus) are another example. Horses have been integral to human life throughout history, and hold widespread cultural significance. But horses are not native (at least in the modern era) to many of the places where they currently roam, and many of their populations have high growth rates. Some nations, like Australia, cull their wild horse populations in an attempt to control grazing impacts on indigenous plants. In an Argentinian provincial park, wild horses have reduced native plant cover and allowed invasive pines to gain a foothold—a result that conflicts with the park's fundamental management goal of preserving the native grasslands. Lead author Erik A. Beever of USGS explains that, as with the parakeets, social and ecological scales are at odds with each other for these iconic mammals. Management approaches can be standardized at the state or national level, yet the differences in how horses' influences play out in nature illustrate the importance of locally-relevant approaches. "Horses can move very far," he said, "but their management areas can be small and the boundaries do not shift over time or account for seasonal movement." 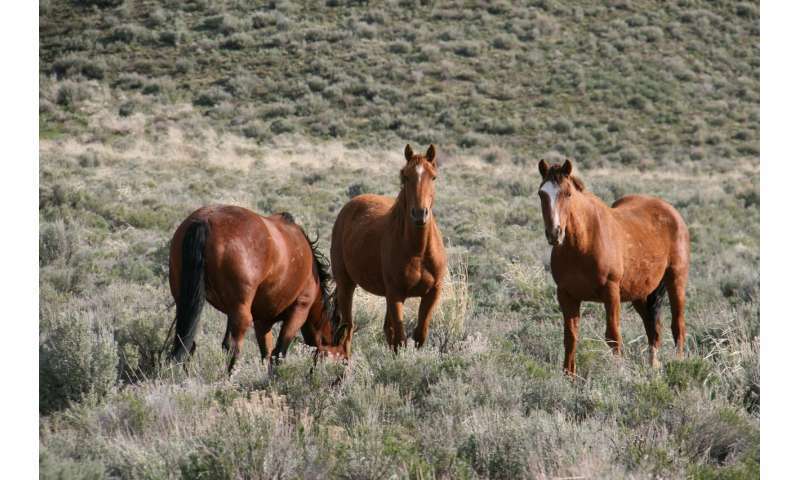 Additionally, management decisions and projects may take months to years to come into effect, while natural events can shift horse populations in days or weeks. "There are tools, techniques, and approaches that can help to bring progress and even resolution to these situations," he says. "Addressing social-ecological mismatches will be an important element to effectively manage introduced species; this will require early, meaningful communication about complex management issues among researchers, managers, and the public, and a collaborative search for practical solutions and compromises." Native invaders—a chink in the armour of ecological policy?